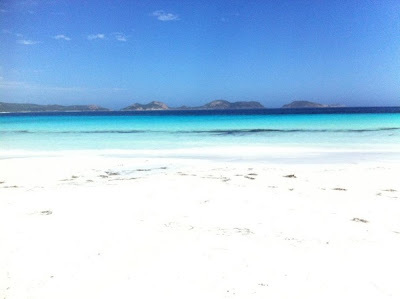 Esperance on the south east coast of Western Australia boasts that it has Australia’s best beaches. Town beach is pretty, but the beaches that really stick in your mind are those in the Cape Le Grand National Park. Le Grand is the first beach you come across in the park. Le Grand lives up to its name. The beach is a wide flat expanse of, often very windy, sand. The beach looks across the Recherche Archipelago, or Bay of Isles and on a clear day you can make out Esperance behind the islands. This is one of the two areas in the park offering camping facilities. The next beach along the coast here is Hellfire Bay. It is a small bay surrounded by orange rocks that presumably inspired the name. There is a picnic area here and toilet facilities. This is a beautiful little bay but has a sad history. The bay is named after John Thistle, a sailor who drowned here in 1802. An interesting feature of Thistle Cove is the large granite rock by the car park that whistles or hums with the wind, depending on which side of it you are standing on. There is a lovely walk out to the headland from Thistle Cove, but there are no facilities here. 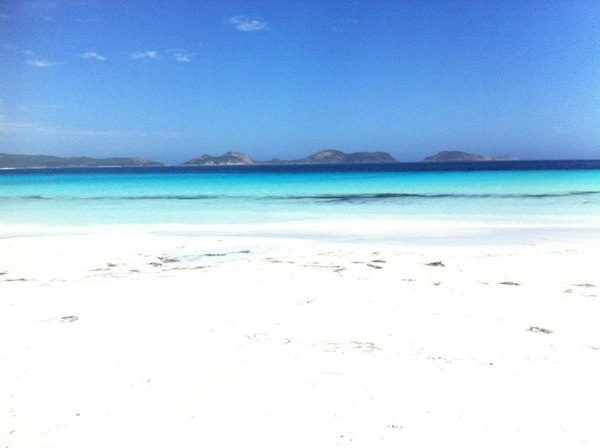 Lucky Bay is widely considered to be the jewel in the park’s crown. The colour of the beach and the water here is truly amazing. Lucky Bay hosts the other campsite in the park, featuring an ablution block, toilets and cooking facilities. It is also home to a gang of wild kangaroos who are often to be found sniffing through heaps of seaweed on the beach and stealing from campsite barbecues. Rossiter Bay is the last of the main beaches within the park. Rossiter Bay was also named after a hero. In 1841 Edward Eyre and his Aboriginal companion Wylie crossed the Nullabor and found themselves at Rossiter Bay and close to starving. Luckily for them Captain Rossiter and the crew of the Mississippi came by and picked them up. There is an entry fee to enjoy the park. It is currently (in 2012) $11 per car and payable ahead of arriving. The best place to pay this is at the Visitor Centre in Esperance. Tickets should be displayed inside car windscreens as the resident park rangers often perform spot checks. The fee is not payable if you enter the park on foot or by sea. Have you been to any of these beaches? If so, what did you think?